⌚️⌚️⌚️2018 New Color HD 1.3 inch Display Fitness Wristband for Men Women Kids with Heart Rate Sports Activity tracker. Step 1.Download APP "WearHealth" by Scan the QR code instruction. then Fine"Mine", then click "Connect a bracelet" to pair with your phone. Just 1 second quick connect! Step 3: Finish pairing, you can unlock more features. 1. IP68 waterproof, Synchronous data to APK/APP. 2. Heart rate detection, Sleep detection (Sleep time, Sleep quality). 3. Clock alarm, Time, Pedometer, Calorie Consumption, Distance Calculation, Sleep time, Off display. 4. Standard exercises functions (Pedometer, Calorie Consumption, Distance Calculation). 5. Task Reminder (Sedentary reminder). 6. Anti-lost function (Overtop the working connection distance between the mobile phone and bracelet will give the reminder). 7. Calls to remind, SMS Reminder, the Third-party messaging reminder: Multilingual push. 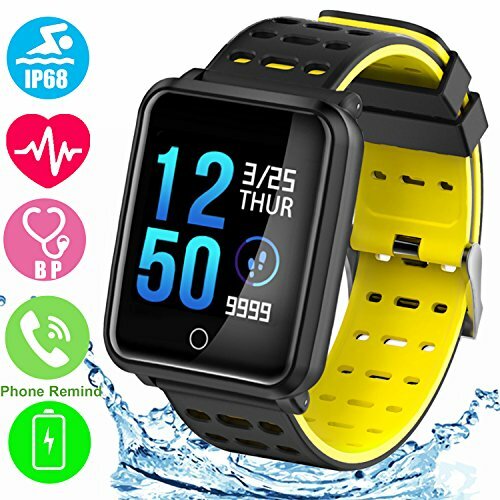 ‍IP68 Deep Waterproof &1.3" Scratch Resistant Touchscreen: Upgraded wearable wristwatch with TF2 240*240 Tempered Glass Mirror Super-Definition display screen, Do not worry about Scratch! It will bring you visual experience and shows you data clearly even in the glare. IP68 depth waterproof and dustproof performance, accompany you when running, driving, even wearing it for swimming. Double-color strap is made of sturdy and soft silicone, comfortable wearing all day.  Long Last Battery Time & Lifetime Warranty: ❤ Comes with a 1-month hassle-free return,3-month free replacement and 12-month warranty. ❤ Long standby time,200mAh large-capacity battery with low-consumption chip improves standby efficiency. Working time reaches 5-7days and standby time reaches 25 days.